The Pac-May brouhaha won't end on fight day, especially if our Pambansang Kamao wins! We're just days away from the #FightOfTheCentury! Pilipinas, are you all set to wear our national colors, scream your hearts out, and root for our man Manny Pacquiao in his ring date with Floyd Mayweather? We are! Even if naysayers and Mayweather dickriders fanboys constantly say that the Pac-Man will get beat, we believe that our pambato will pull through with the W. And this ain't just blind hope; he is, after all, the first and only eight-division world champion in boxing. Money better watch out! It doesn't matter if Manny scores a split-decision, K.O., T.K.O. or unanimous decision victory. If he wins, we'll be happily chugging down copious amounts of alcohol in a celebratory drinking spree. The drawback: hangover cases will also rise the day after the bout. But, really, will you complain? It goes both ways though. If Pacquiao loses, alcohol will be the BFF that will woo the sadness away for many of us. In other words, booze will be there no matter what. 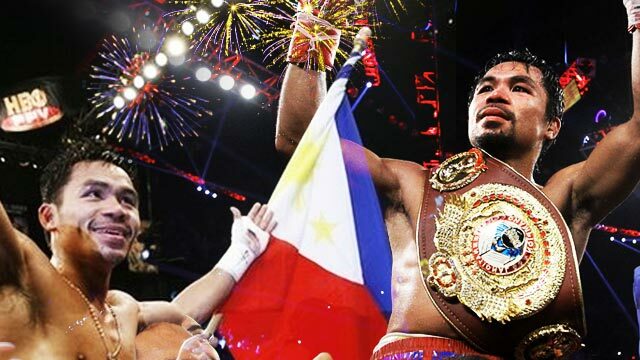 We're proud to be Pinoy, and we'll be even prouder if Pacquiao wins, so much so that we'll let the rise of the number of annoyingly cheesy "Pinoy Pride" posts pass. If there's one moment to take pride in, this is it. Beating Mayweather will increase Pacquiao's already-stratospheric popularity ten-fold. And when someone's that "hot," expect those who want to make pabango to their image to be close behind. Book it. Not that those guilty of saying it whether physically or via the online world are serious (we mean, c'mon now! ), they're just super glad that Pacquiao won (like the rest of us). It's probably more of an expression rather than an educated opinion on who should be the next president. We'll be content with celebrating with our vocal chords and booze, but for those who have a bit more moolah, buying a brand-new Pacquiao shirt/shorts/socks/action figure will be part of the post-fight festivities. We understand and if we have cash to spare, we'll have no issue covering our bedrooms with all sorts of Pac-Man merch. We'll be that happy. We see Pacquiao-based memes almost every single day—and the fight has yet to happen! And after the final bell and if Pacquiao is the winner, man, expect the Internet to burst at the seams with Pacquiao memes. The only difference? We'll have legit bragging rights because, as they say, "To be the best you have to beat the best." In case you didn't know, the Pacquiao-Mayweather fight has no rematch clause. It's a one-and-done deal, so to speak. However, we have a gut feel that, if ever Floyd loses, he'll be demanding a rematch immediately because losing an unblemished record and getting beat by a fighter that's supposedly "inferior" won't sit well with his oversized ego. He'll be offering the standard excuses as well (e.g. "It's the judges' fault!"). The promoters, Bob Arum and Co., will also find a way to somehow schedule a rematch. We actually see the point: It's just too big a fight to end in one match (if ever the decision was controversial, that is). And we're confident that Pacquiao-Mayweather 2 will aslo have the same winner. He already has a resume that puts him in the Top 15, maybe 10 boxers of all time. Winning the May 2 fight will push his ranking into the Top Five. We're no fans of Mayweather but you have to admit, the man has skills and is among the best of this era. Beating him is the best evidence that Pacquaio needs to be in the same level as Muhammad Ali and Co.
We're calling it! It's sad to never see him lay the smackdown inside the ring again, but we'll be happy knowing that he exited the game in style. He has nothing to prove (and don't need to chase hundreds of millions) anymore. That is if a rematch isn't held, of course. Sports Illustrated has been criticized for not naming Manny as their Sportsman of the Year in previous years, even if the boxer defeated bigger rivals like Oscar dela Hoya, Miguel Cotto, and Antonio Margarito. If he defeats Mayweather, they'll have no choice. FINALLY... PNOY WILL DECLARE A NATIONAL HOLIDAY! Kidding! We're free to dream, right?